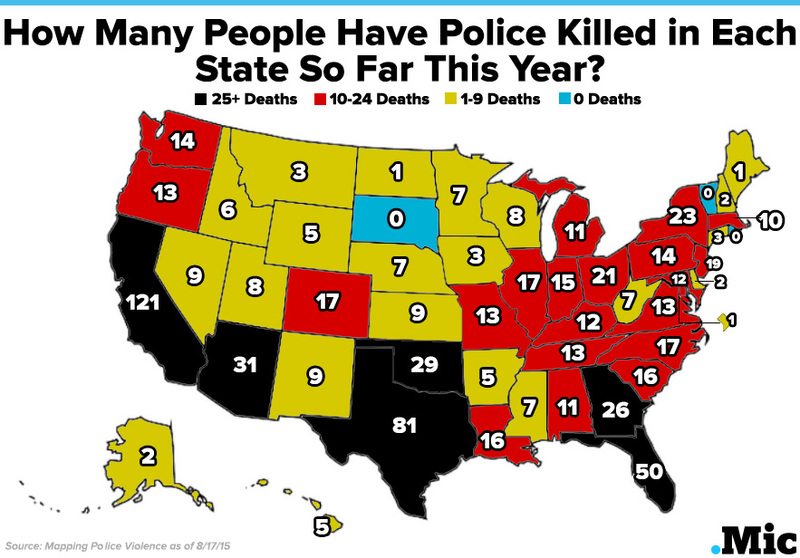 Since Jan. 1, 2015, police in the United States have killed a staggering 745 people. According to statistics provided to Mic by research collective Mapping Police Violence, American police are on track to kill around 1,200 people in 2015 if the slayings continue at the same pace through the remainder of the year. The map below shows how many individuals have died in each of the 50 states and D.C. While there’s a clear correlation between the number of officer-involved homicides and the population size, a few states stand out as having extremely high numbers of deaths. Reblogged this on Deborah Lee Jarrett. Forget license plate readers on police cars, how about on garbage trucks?